Andrew Wordes, an innocent man who had legally been raising a few dozen chickens and other small birds in the backyard of his suburban Atlanta home, is now dead, following a crusade of terror perpetrated against him by the City of Roswell Georgia. Andrew Wordes, who died during a recent raid on his property in which county marshals tried to illegally evict him, was the obvious victim of a rogue state gone mad — and his blood is now on the hands of the Roswell City Administrator, the Roswell City Council, and the Roswell Police Department, all of which robbed from Wordes his property, his livelihood, and ultimately his life. Andrew Wordes had long raised his small poultry friends in the backyard of his one-acre property at 335 Alpine Drive in Roswell, Georgia, sharing eggs, chicks, and friendly words of wisdom and encouragement with his neighbors and with local schoolchildren all along the way. Andrew Wordes was very active in his local community, having organized a North Georgia Pet Chicken “Meetup” group, and founded a chicken breeding club. His friends and neighbors described him as a generous, kind, and loving man who was always willing to lend a hand, and who would have given you the shirt off his back if you needed it. But Andrew Wordes met his unjust fate on March 26, 2012, after roughly four years of enduring illicit and seemingly-endless abuse, bullying, threats, and unsubstantiated legal action taken against him by Roswell city officials with an apparent axe to grind. And after losing his birds, his freedom, his entire life savings, his property, and his livelihood as a result of the City of Roswell’s sadistic war against him, Andrew Wordes ended up losing his life as a result of an explosion that occurred during the final eviction raid carried out by Fulton County marshals. The saga allegedly began in 2008 when a disgruntled neighbor of Andrew Wordes reportedly complained to the city about Wordes raising chickens, button quail, and other small creatures in his backyard. The City of Roswell responded by issuing Andrew Wordes a citation for his chickens, even though the city’s Code of Ordinances specifically provisioned at the time that property owners on less than two acres of land could legally raise chickens and swine. With the help of Roswell’s Mayor Jere Wood, a lawyer friend of Andrew Wordes who also raises chickens himself, Wordes was able to get the citation issued against him dismissed in court. But the firestorm of childish retaliation and rage that quickly ensued as a result of Andrew Wordes standing up for himself and his rights, rather than capitulating to the city’s tyrannical and mindless demands that he get rid of his chickens, will likely go down as one of the most tragically absurd abuses of power in the history of local government. After it became clear that Andrew Wordes was not about to let the City of Roswell trample all over him and his rights, several city officials allegedly kicked their vendetta against him into high gear, not only to forcibly have Wordes’ chickens removed, but also to seize his property right out from under him. After failing twice to get Andrew Wordes nabbed for their made-up code violations, the City of Roswell actually rewrote the law to prohibit residents from raising more than six chickens in an effort to seal the deal. But even this failed, as a judge later ruled that Andrew Wordes, who had been in his home for more than a decade raising chickens, would be “grandfathered in” under the old provisions which allowed for residents to raise backyard chickens. So the City of Roswell switched gears again and began to play even dirtier by getting Andrew Wordes arrested for petty violations, and proceeding to reclassify his property on their long-term planning map as future green space. So it appears as though the City of Roswell used the supposed neighbor complaint as an excuse to pursue Andrew Wordes’ property for the purpose of eventually turning it into parks and green space. This would explain why the city failed to properly maintain storm water infrastructure near Wordes’ property, which resulted in his property becoming severely flooded at least a dozen times, and eventually uninhabitable. Not only did the City of Roswell fail to abide by legal guidelines that required it to maintain storm water infrastructure around Wordes’ property, but the city added insult to injury by refusing to file paperwork to the U.S.Federal Emergency Management Agency(FEMA) following a flood that caused severe damage to Andrew Wordes’ home, which is also located on a floodplain. As a result, he had no means by which to fix the damage. And when Andrew Wordes attempted to protect his property from future flood damage by grading his land with a Bobcat, which he borrowed from his friend Mayor Wood, the City of Roswell actually had the audacity to issue Wordes a citation for grading his land without a permit, and for having too many cars on his property at the time. From this point on, City of Roswell officials began harassing Andrew Wordes, and the local police department began to surveil his house on a regular basis, watching closely for anything that might be considered a violation. In the process, he was pulled over and even thrown in jail on numerous occasions. In violation of the Fair Debt Collection Practices Act and several other laws, Roswell Code Enforcement Supervisor Vicki Barclay (http://www.roswellgov.com/index.aspx?NID=94) allegedly called Wordes’ mortgage holder, an 80-year-old woman, and coerced her into selling Wordes’ mortgage note for 40 cents on the dollar to another mortgage holder by threatening to issue liens, citations, and grievances on the property if she failed to comply. Barclay is the same city official who had illegally tried to issue Wordes a citation for his chickens from the very beginning. Having failed at all other attempts to seize his property, the City of Roswell then filed a zoning violation against Wordes claiming that his property was a “nuisance.” The city also filed a 55-page civil lawsuit against Andrew Wordes, which conveniently denied him the right to a city-funded public defender who was supposed to represent him in legal dealings involving the city. 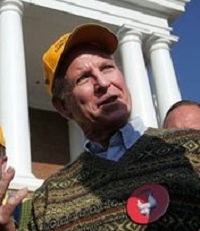 Even with former Georgia Governor Roy Barnes on his side, Andrew Wordes was rapidly losing the ability to fend off these ravenous wolves in the City of Roswell government that were hellbent on forcing him off his property for their own devious purposes. And Roswell City Administrator Kay G. Love (http://www.roswellgov.com/Directory.aspx?EID=3), Roswell City councilmember Becky Wynn (http://www.roswellgov.com/directory.aspx?EID=6), Roswell City councilmember Rich Dippolito (http://richforroswell.com/about-rich.php), and Roswell Code Enforcement Supervisor Vicki Barclay (http://www.roswellgov.com/index.aspx?NID=94) all played a key role in making this happen, according to accounts. The madness did not stop at Andrew Wordes’ property, however, as even his animals eventually got caught in the fray of the City of Roswell’s campaign of terror. According to reports, Andrew Wordes’ home was vandalized in 2011 while he was attending a local political rally, and when he returned, he found that his animals had also been poisoned. Roughly one-third of his animals, which included turkeys, chicks, and adult chickens, ended up dying as a result of this poisoning. Andrew Wordes filed a police report in response to these crimes, but the Roswell police department never pursued the case, and it was never determined who committed them. Consequently, Wordes lost a significant portion of his income and livelihood as a result of the mysterious deaths, which made his already-burgeoning financial problems even worse. After attacking him from practically all angles and nabbing him for every single petty violation they could think of, the City of Roswell finally ended up jailing Wordes for a whopping 99 days. And immediately after Wordes was jailed, the City of Roswell issued a public press release letting the public know that Wordes’ house was now “vacant,” a purely vindictive move that had terrifying consequences. Within just a few hours of the announcement, Wordes’ house was vandalized and looted. Even though the City of Roswell promised to keep an eye on the property after issuing the press release, criminals were somehow able to steal Wordes’ firearms and weapons, ammunition, and other valuables, which put the entire community at risk. During this time, Wordes was refused the ability to proceed with the bankruptcy filings that would have halted the illegal foreclosure on his property which, conveniently for the City of Roswell, was moving forward during his time in jail. As pointed out by Maggie West Bean writing forExaminer.com, the foreclosure paperwork was not even legal to begin with, as it lacked necessary information proving its validity (http://www.examiner.com). At the end of his rope and facing insurmountable and unrelenting oppression, Wordes’ final hours were spent in his unlivable home, where Fulton County marshals staged an elaborate demonstration of police state force by illegally raiding Wordes’ property. According to reports, the standoff concluded when Wordes finally told television reporter Mike Petchenik, who he had called to the scene by phone, to have the marshals leave the property. Moments later, an explosion was heard, and Wordes’ house became engulfed in flames. While it has not yet been determined whether Wordes’ death was a suicide or a murder, it is clear that the City of Roswell has a whole lot of explaining to do concerning its role in the escalation of this situation over the past four years. As usual, mainstream media reports about the saga fail to mention how the City of Roswell committed numerous criminal acts in its illegal pursuit of Wordes, or how the city is now officially lying, on record, by claiming that it played no part in working behind the scenes to transfer Wordes’ mortgage and foreclose on his property. It is unfortunate that NaturalNews only just now learned about the Wordes saga after the man’s death, as it may have been possible to help him earlier on by raising awareness about the injustices being perpetrated against him. But at the very least, we can all fight for justice now by banding together to make sure the facts come to light, and the criminals involved punished for their crimes. The case also serves as a reminder to others who might be enduring similar harassment to speak up now about what they are going through. The reason why news sites like NaturalNews, InfoWars and others exist is to draw attention to issues like this, and to bring what goes on in the darkness to light — so if you or somebody you know is facing similar harassment by city officials, tell us about it!